The dog who came to mini-break - Me, Annie Bee. This week we had a furry house guest in the form of my parents dog, Leo. 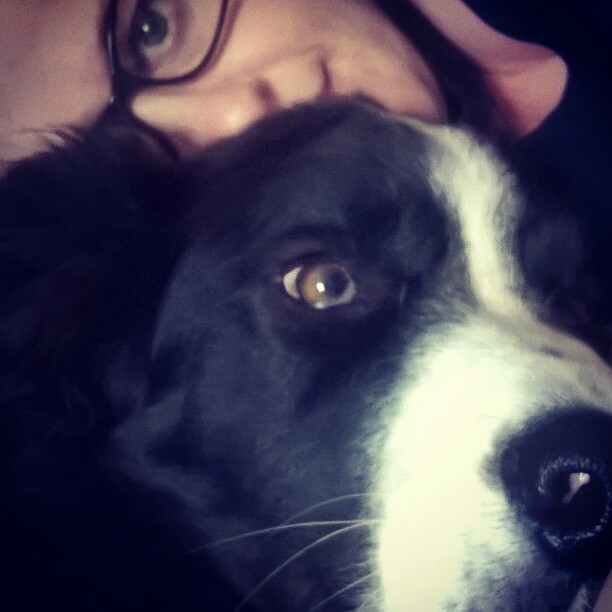 He’s a lovely fellow, a great big handsome soft lump of border collie. Although we have two cats I’ve always declared myself a dog person and always thought that one day we’d get a dog. It’s like having an extra child. Or more specifically an extra Seth. It’s exhausting! Our cats don’t like the dog so they took to living upstairs for a few days, well Xabi did. Louis split his time between sleeping upstairs and sitting on the windowsill outside tapping and taunting the dog. The dog is so very desperate to get at the cat while the window or a child gate is in the way, barking and giving it the big ‘I am’. The few times there’s been nothing between them though, he swiftly turns sheepish (funny that for a dog scared of sheep) and doesn’t quite know what to do. Moving around the house to keep them all separated is like trying to leave the lemur enclosure at a wildlife park. Constantly checking this door or that gate is closed before opening another. Usually when I leave the house I set the alarm and leave, however, the dog and the boy together have no urge to hurry between them so they’re too slow at leaving before the alarm goes off. Instead I have to wrestle them outside and shut and lock the door with one hand whilst wrapped in lead, dog and child. For morning walks, Seth and I took him to a field up the road. Leo is from the countryside, he has no ‘big’ road sense at all. We get to the pedestrian crossing, press the button and I tell Leo “sit”. Both Leo and Seth go to sit down. They both stand up and Leo goes to walk across the road. Both start to sit again…. You see how this pans out right? I swear the man at the traffic lights was laughing at us. When we finally got to the field, the dog retrieved his 3 foot log from the night before, leaping around with it in his mouth, like a large spring lamb, nearly taking Seth out with it every time he dashes past. Seth thinks it’s hilarious and would also quite like to stomp through the muddy puddles. It’s time to leave but no before Leo does his business. Poop-a-scooping with one hand whist holding a lead and Seth’s hand in the other is, unsurprisingly tricky. I can’t let go of the dog, he might run. I can’t let go of Seth, he WILL run. Leo is an only dog, he doesn’t understand why his needs aren’t met first and foremost. He doesn’t understand why he has to wait for me to secure Seth before I can let him out into the garden. Similarly Seth can’t understand why the dog is allowed to play in the garden in the rain and he isn’t. The dog doesn’t understand why Seth eats all his food and doesn’t drop crumbs. Seth doesn’t understand why, when he accidentally DOES drop some food the dog eats it. Grumpy faces all round. Leo doesn’t understand why we can’t play fetch with every ball in the house because he eats them and the children get upset. Seth doesn’t understand why every time he picks up a ball or something stick like, Leo tries to take it from him or follows him waiting for it to be thrown. Leo definitely isn’t used to all the noise and shouting. He spent a long while looking forlornly out of the window waiting for Rory, or my parents, to come home and save him. Due to the lack of heroes on white horses, Leo found himself the perfect little hidey hole. The downstairs toilet. As much as I’ve loved having Leo around I have discovered that our house is not yet dog ready. I need to get Seth house trained first.